Abcam’s C-Reactive Protein (CRP) in vitro SimpleStep ELISA® (Enzyme-Linked Immunosorbent Assay) kit is designed for the quantitative measurement of CRP protein in Human cell culture supernatant, serum and plasma samples. CRP displays several functions associated with host defense: it promotes agglutination, bacterial capsular swelling, phagocytosis and complement fixation through its calcium-dependent binding to phosphorylcholine. CRP can interact with DNA and histones and it may scavenge nuclear material released from damaged circulating cells. CRP is secreted; it forms a homopentamer pentaxin (or pentraxin) which have a discoid arrangement of 5 non-covalently bound subunits. CRP binds 2 calcium ions per subunit. The concentration of CRP in plasma increases greatly during acute phase response to tissue injury, infection or other inflammatory stimuli. It is induced by IL1/interleukin-1 and IL6//interleukin-6. Our Abpromise guarantee covers the use of ab181416 in the following tested applications. Example of CRP standard curve. Background-subtracted data values (mean +/- SD, n=2) are graphed. Titration of pooled Human serum within the working range of the assay. Background subtracted data values (mean +/- SD, n=2) are graphed. 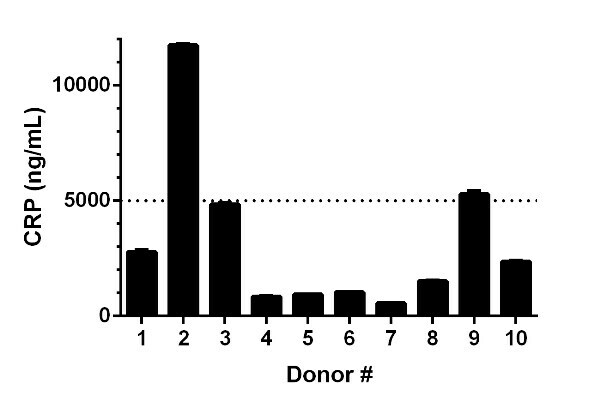 CRP concentrations in 10 individual Human serum donors. 10,000X diluted sera from 10 apparently healthy male donors were measured using this kit. Interpolated data values corrected for sample dilution are graphed in ng of CRP per mL of serum (mean +/- SD, n=2). 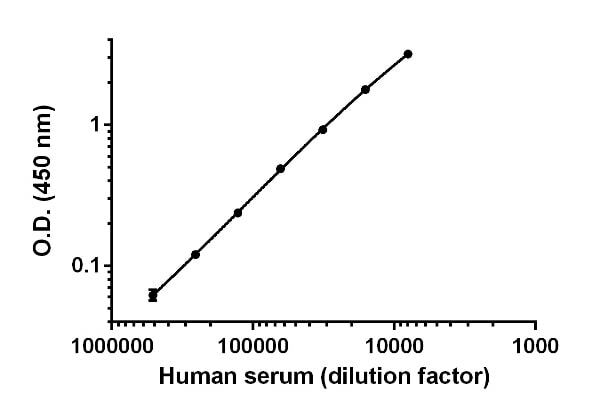 Nine out of ten individual Human sera tested within or at reported Human serum range (< 5,000 ng/mL, dotted line). The mean of CRP concentration of these nine individual sera was determined to be 2,240 ng/mL with a range of 559 – 5,285 ng/mL. Note that one individual Human serum sample (donor # 2) tested substantially higher, 11,737 ng/mL. Comparison of CRP signals in three healthy and three rheumatoid arthritis patient sera. Background subtracted data values of two serum dilutions (as indicated in parenthesis) are graphed (mean +/- SD, n=2). 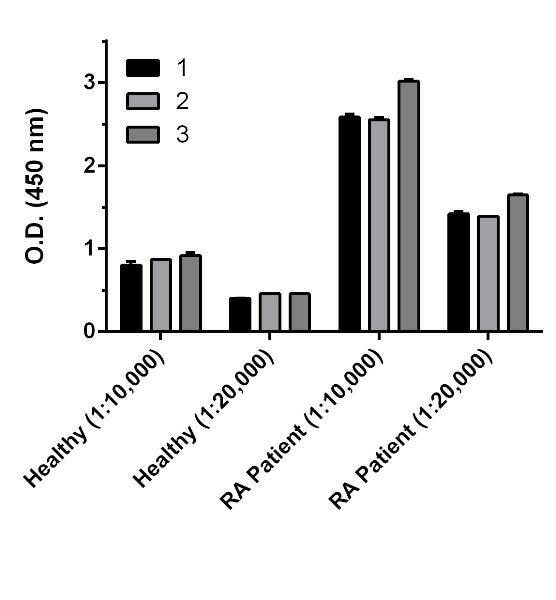 Quantification of CRP concentrations in three healthy and three rheumatoid arthritis (RA) patient sera. 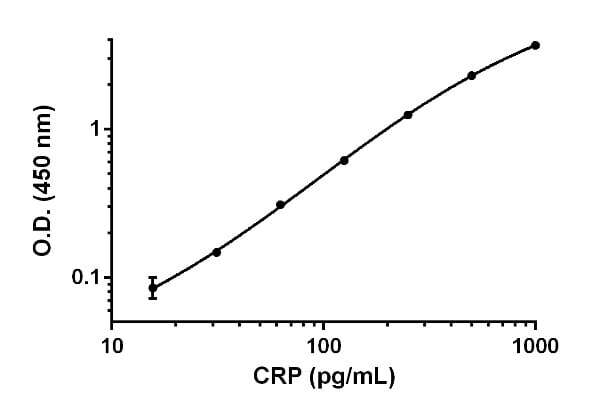 The concentrations of CRP were interpolated from data values shown above using the CRP standard curve, corrected for sample dilution, and graphed in ng of CRP per mL of serum. 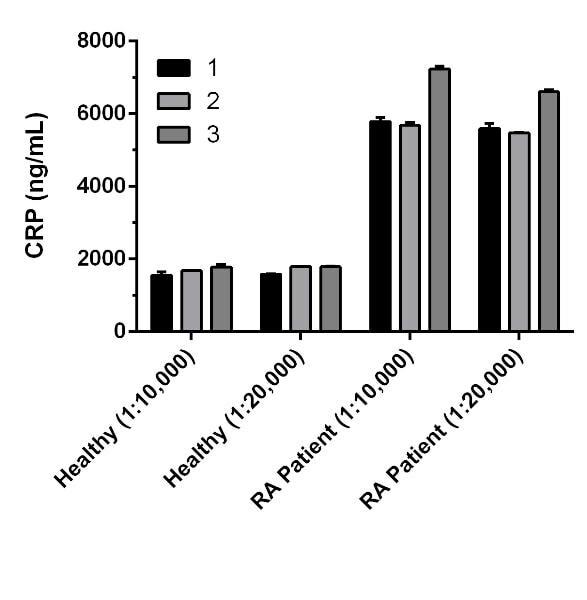 As expected, note that the CRP serum concentrations are increased in RA patients. Do you have a protocol for measuring crp in dried blood spots on filter paper using one of your elisas? We do not have an in-house ELISA protocol for detection of CRP in dried blood spots. We did however receive a positive review of our CRP ELISA ab181416 from a customer who used it with DBS samples. Here is a link to the review, in case you have not already seen it. This product requires half day compared to traditional one-day work for ELISA. Cons: Lower sensitivity than the traditional counterpart Abcam carries. This is not an issue for CRP since its concentration is generally high. The amount of sample diluent is not sufficient to do an accurate dilution given that you have ~96 samples.